Buzzing in beauty are organic oils – for face, for body, for nails and for hair. Oils have been used since mankind basically and are now experiencing a massive resurgence. Oils nourish, hydrate, heal and balance the skin no batter what the skin type is. Contrary to belief they don’t clog up your pores. So don’t be intimidated by thinking you will end up looking like a spotty teenager – you won’t – instead will have gorgeously hydrated skin. And unlike the majority of what you can buy in beauty department stores these products are natural – ie free from artificial ingredients and full of organic goodness. As this winter has been especially harsh oils came to the rescue and nourish my skin. The trick is to massage the oil into your face in circular movements – therefore stimulating the blood flow of your skin. 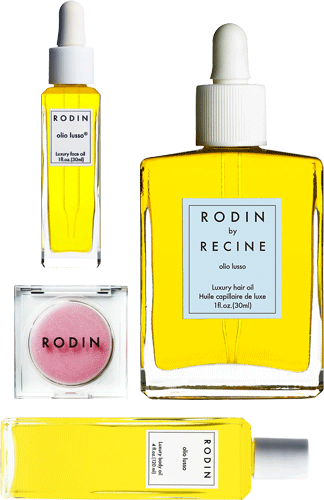 Rodin facial oil was developed by a make up artist. As you can imagine models do many shows during fashion week and need to be made up in the minimum of time possible. Travelling, working crazy hours, cleansing and reapplying (crazy!) make up to their skin can have negative impact, hence make up artists often travel with some Rodin Oil in their make up bag to rescue the models skin. This product comes with a hefty price tag so below are some products that are a bit more affordable. I really rate Kiehls midnight recovery oil – it smells delicious and is absorbed really quickly. Recently I tried out Josie Maran which you can use on hair, face, cuticles you name it. Great for travelling as it is multi use product. It is basically pure argan oil so really delicious stuff. When I went skiing a couple of weeks ago I bought the Clarins blue orchid oil. from a knowledgeable swiss pharmacy sales assistant. She was so right in advising me this bestselling oil. It is my current favourite as the botanical fragrance puts you in a very relaxed state of mind before going to sleep and the 100% natural ingredients (rosewood, patchouli, blue orchid & hazelnut oil) do their best over night! In the morning I add 2 drops of this into my moisturizer to add extra hydration. Since last week i have been using Aurelia Cell Repair night oil which has been a delight, see my blog post on this brand here. Finally I am also a massive moroccan oil fan to keep my hair in check and have been known to drag liters home with me from the pop up store at cosmoprof in Bologna. Have you got any favourite oils you simply love?